“The single biggest issue that’s facing the music industry is there are huge waves of devices being sold and shipped to consumers on a daily basis. Very few of these devices are then subsequently used to subscribe [to] legitimate downloads,” says Universal Music executive Rob Wells. Enter Nokia’s new “Comes With Music” devices. Announced at the annual Nokia World conference today, “Comes With Music” will enable customers to buy a Nokia device with a year of unlimited access to “millions of tracks”, and, rather surprisingly, get to keep those tracks once the twelve month period ends. Of the four major labels, however, Universal Music is the only one to have signed on. Nokia gave no further details, such as the type of DRM employed (if any? ), and the likely cost of “Comes With Music”-ready handsets. Nor in which regions the service will eventually be made available. “We set out to create the music experience that people are telling us they are looking for – all the music they want in the form of unlimited downloads to their mobile device and PC,” said Nokia’s Anssi Vanjoki in a prepared statement. For cell phones, the hardware manufacturers or cell carriers will absorb the cost of a roughly $5-per-month subscription fee so consumers get a device with all-they-can-listen-to music already enabled. It is not clear whether the devices will cost more to the consumer to cover Total Music fees or if they will be charged for the service through their phone bills. However, where TotalMusic and the Universal/Nokia model appears to differ, is that, as already mentioned, users get to keep the music they’ve downloaded even after their “subscription” period ends. On that point, Wells says that he doesn’t expect customers to try to download all of the music that Nokia makes available. “I don’t believe that every consumer who buys these devices will clot themselves on everything they can. I believe there will be large proportion of consumers that won’t use this device for any music,” Wells said. Update: “Comes With Music” will employ Windows DRM. See our follow-up post ‘More details on Nokia, Universal’s “Comes With Music” offering, and why TotalMusic is doomed from the start‘. There is no way investors will allow that to happen. Eventually it’ll cost the consumer. Ugh. Windows Media DRM? Give me a break. These guys just don’t get it. This is a trap, people. I bet Apple won’t be able defeat nokia in this competition. What Nokia is lacking is a point of sale client. Apple has iTunes which makes anyone sync/backup everything on their computer. If Nokia knows what their doing, they will mimic this and have a chance to take a little chunk of the pie. But I doubt Apple will lose out on this. In fact, I’m sure people will realize just how easy it is to use iTunes compared to anything else out there. If this does work out for Nokia, this venture will help consumers (all consumers) listen to any song they please on their phone/mp3 player. Let’s see where this goes, but there is a reason only Universal is playing along. The day that they can make a product BETTER, or at least as good as i can make it myself, i see no reason to dance to their tune so to speak… Still boykotting music sales, radio ftw! “What Nokia is lacking is a point of sale client. Apple has iTunes which makes anyone sync/backup everything on their computer. If Nokia knows what their doing, they will mimic this and have a chance to take a little chunk of the pie. All nokia devices are mass storage enabled also they sync with any player and have a strong support for windows media player. one big advance they have they sell in a year around 100 millions to 200 millions handset.. with mp3 player enabled. while the ipod have sold that much since it existence…. 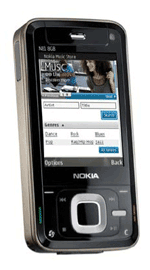 also nokia OVI doesn’t require special software you can buy music from the phone from a pc (any browser )and tranfer it back a forth with a simple drag and drop. no locked to itunes like with apple.